They are referring to the Sponge Docks at Tarpon Springs, Florida. It brought back memories from childhood vacations to Florida with my family. We always stopped at any place "Greek" along the way. As a child I loved seeing the divers, the sponges on the boats and laying on the docks, feeding the pigeons (before it was dangerous), little stores with tons of Greekish nicknacks and the old Papas Restaurant. 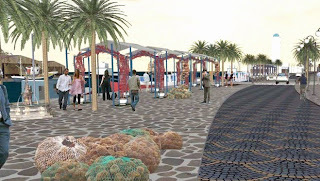 I was happy to read that the makeover plans are being reworked to keep the Greek feel. It would be a shame to change this place that has such a rich Greek culture in the United States and make it look like "Disney Land". 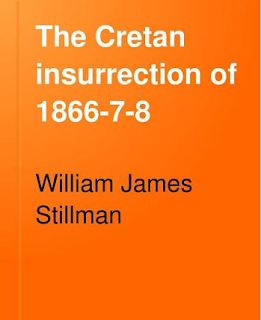 The book "The Cretan Insurrection of 1866-7-8" by William James Stillman was published in 1874 by Henry Holt and Company, New York. It is available as a FREE Google ebook. If you had relatives who were in Crete during 1866 through 1868 this might be an interesting read. Below you can find a list of the 25 Greek names listed in the book and the Table of Contents. FREE Online Antiquarian Books - they are GREAT! Here is a link to Cyprus as I saw it in 1870 by Samuel White Baker. It was published in 1879 London by MacMillan & Co. Here is another group of links I haven't had a chance to categorize yet. Good luck with your Greek family genealogy research. Join the "Hellenic Genealogy Geek" Facebook group and post your family queries. In a joint decision taken by the Health, Environment, and Interior ministries yesterday, facilities will be created so that people who choose to be cremated may do so. The legislation that allows for the creation of crematoriums - to be built next to cemeteries and comply with specific regulation on emissions - has been approved. . . . . . . . . . Although cremation has been allowed in the UK since 1884 and France in 1887, Greek lawmakers only approved legislation in 2006 allowing for the cremation of the dead to take place in Greece for the first time in the country's history. The new law permitted the cremation of people who request this method instead of burial as long as their religion also allows it. The law still forbids cremation for Orthodox Christians. The Church of Greece opposes the practice for believers, arguing that Orthodox traditions only allow for burial. 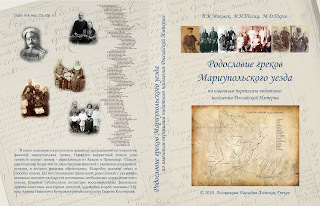 New book - GENEALOGY OF GREEKS IN MARIUPOL, UKRAINE - "The title of the book which was recently published by the publishing house “Notioanatoliki” in Donetsk, Ukraine is “The Genealogy of Greeks in Mariupol”. The book is based on the research study on the origins of surnames of Greeks in Azov, which focused on searching documents on the first Greeks who were expatriated from Crimea in the Azof, who are in fact the “founders” of the first Greek families in Mariupol, Ukraine.